Polka Dot Overload | Sewing, knitting & vintage projects, tips, tutorials and cartoons! 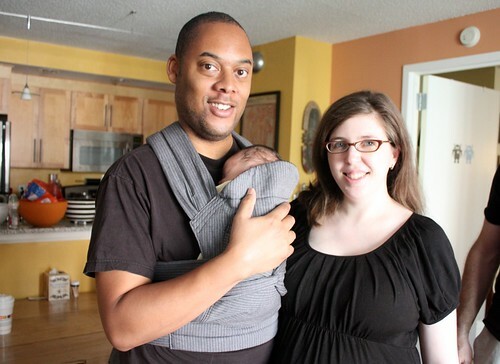 : Make Your Own Baby Sling! 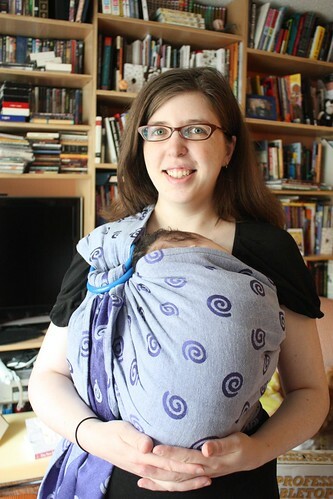 I mentioned a while back that in addition to sewing up dozens of cloth diapers, my mother also made us a whole host of baby carriers for wearing little Z. And Masheka and I took an excellent free Babywearing 101 workshop at Metro Minis in Manhattan to learn about five major types of baby carriers (pouches, slings, mei tais, soft structured carriers and wraps) and how to use them safely. The safest position for small infants is an inward-facing front carry, tummy-to-tummy with baby up high enough on the sternum that you can kiss the top of her head. Baby's head is to the side, with plenty of clearance so she isn't chin-to-chest. 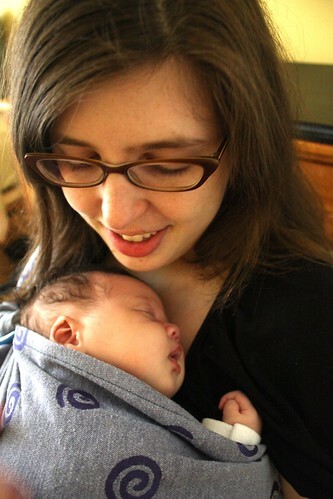 The above is one of the ring slings my mother made, my current favorite for around-the-house babywearing. She just used a piece of reversible upholstery fabric she got at Jo-Ann's with some baby-wearing-quality ring slings purchased from SlingRings.com. Slingrings.com also has links to a bunch of sling-making sewing patterns. I'm not sure which one she used, but it has a pleated shoulder and a handy pocket on the tail and she tells me it was a super-easy and quick project (not to mention much less expensive than commercial ring slings). Except when we're sleeping, either Masheka and I hold and cuddle Baby Z nearly every minute she's awake (and much of the time she's asleep). She's not fussy or colicky, but it's pretty clear she far prefers lying on our chests to lying in her cosleeper or crib. So without a way to carry her hands-free, I'd be hard-pressed to even make myself a sandwich or make a phone call, and I'd be even farther behind on my email than I already am (which reminds me--apologies if you've emailed me and haven't heard back!). Anyway, if you want more information, I recommend the forums and articles at TheBabyWearer.com. 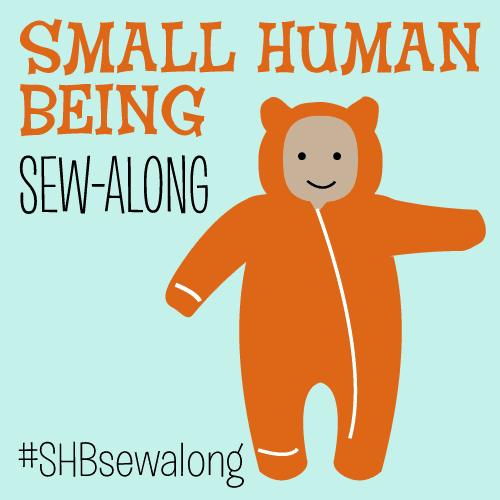 And I swear that someday there will be a sewing-related post here that isn't about baby stuff... really! Aw, so adorable. And you guys look so happy. I'm glad to hear that she's pretty easy and portable. And many thanks for the resources. While I am still many moons away from parenting, I like getting access to all the resources I can. I **LOVE** ring slings!! 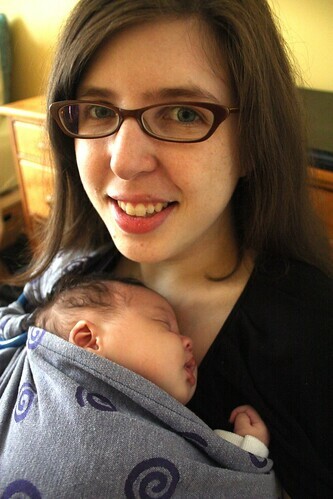 I am working on baby #3, and I don't know how I'd have survived the first two without my trusty wardrobe of slings. They are so fun and easy to make! You need one to match every outfit. I love love loved my sling! I wore my babies pretty much all the time for 6 months until they graduated to the backpack. They were just so happy and I apparently have a very low threshold for crying. I tried a front facing carrier, but it hurt my back and my babies would just hang and cry. I made a ring sling 3 years ago for a friend (she never got the hang of using it), and she passed it back to me. I used rings from slingrings.com, and used a free pattern from mayawrap.com. I chose a neutral striped shirting cotton with no wrong side for the fabric since she was having a summer baby in southern California. I always really liked the finished product, and am happy to have it back! Aw! So sweet! You're reminding me of my early days with Joe. He wouldn't sleep at all except ON a human. It was a big deal when he graduated to sleeping NEXT to me, you know? It was tiring, but it was also so wonderful, feeling him nuzzle up to me in the sling or Moby. Ahhhhhh. Aw! Congratulations on the baby! Love the fabric used for the ring sling! I have such great memories wearing my son in ours. He took some of the best naps in that thing. Oh, and I was able to tend to my oldest hands free. That was great.